Having difficulties looking for copper fittings? We can help you because we have all sizes. Copper fittings are made in accordance with B16.22 and B16.24. Nibco copper fittings are most commonly used for air conditioning pipe works. Nibco copper fittings can be defined into two series namely wrought copper fittings and cast copper fittings and are available in two materials: copper and bronze. This fitting can withstand up to 200 PSI making it suitable for low pressure use. The three common types of joints for copper fittings are brazing, soldering, and threaded. Size Range: 1/4" to 8"
Copper fittings are used to connect with straight copper pipe or tubing. Nibco copper fittings can be defined to two series: Wrought Fittings (600 series) and Cast Fittings (700 series). Wrought fittings are available in extensive range of types and size while cast fittings are only available in standard tube sizes and in a limited types to supply for mechanical and plumbing systems. The design of copper fittings is according to B16.22 and B16.24. Wrought fittings are made from pure copper mill products according to ASTM B75 Alloy C12200. For cast fittings, it is made from Copper Alloy C84400 that consists of 81% copper, 7% lead, 3% tin, and 9% zinc which according to ASTM B54. 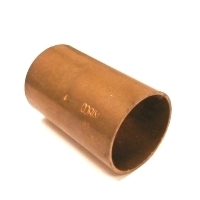 The most used sizes for copper fittings are ranged from 1/8" to 8". Copper fittings can withstand working pressure up to 200 PSI. There are three common joint types for copper fittings: brazing, soldering, and threaded. Brazing is a joining process by heating and melting the filler to bonds between fittings and tube. Compare to brazing, soldering is a slightly low temperature heating and melting process that carried out to bonds fittings and tube. Flux is often consumed during brazing or soldering process. It is to clean the material surfaces and make it easy to join parts together. For more information, please refer to Soldering & Brazing. Another joint type is threaded which is NPT thread. It is to provide adaptability of copper fittings to equipment or pipes connection that having this thread type. The NPT thread is made according to the requirements of ASME B1.20.1. Below table are some abbreviations that used to describe the connection of fittings. ​For more information, please refer to wiki's Copper Fittings.